A paraglider has been airlifted to hospital after crashing on a hill fort in Aberdeenshire. Rescuers said the 26-year-old man activated a beacon after crashing and injuring his leg at about 10:30 at Tap o' Noth, near Ryhine. The beacon's signal was picked up by a team in Houston, in the US, who then alerted police in the UK. 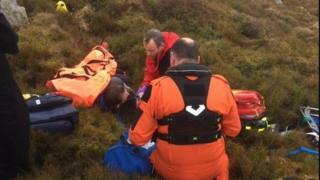 The casualty was airlifted by a coastguard helicopter and taken to Aberdeen Royal Infirmary.